PM Meles died a little over a month ago. Meles died as a hero and as a visionary leader to millions of Ethiopians who grieved for weeks. But what did people see in Meles for them to grieve so much? Watch the clip and you will realize what Meles meant to Millions of Ethiopians! You will realize why people say PM Meles was a visionary leader. You will also realize that Meles was no pretender who masqueraded behind a 'three thousand independence pride' but a realist who was adamant to bring his country from beggar status and debilitating poverty to prosperity! In less than ten years, under his leadership, the future of millions of Ethiopians turned from that of a bleak one to a hopeful one. We think that is why millions cried and grieved but we cannot tell this to the extremists! Instead of seeing a hopeful Ethiopia they(extremists) have decided to live in the abyss pit yearning everyday for a trip to Shaibya's Eritrea which they consider as a heavenly place ! ተስፋየ ለማ October 2, 2012. ታከለ ዓለሙ October 2, 2012. Public Information Notice (PIN) No. 12/117 October 1, 2012. 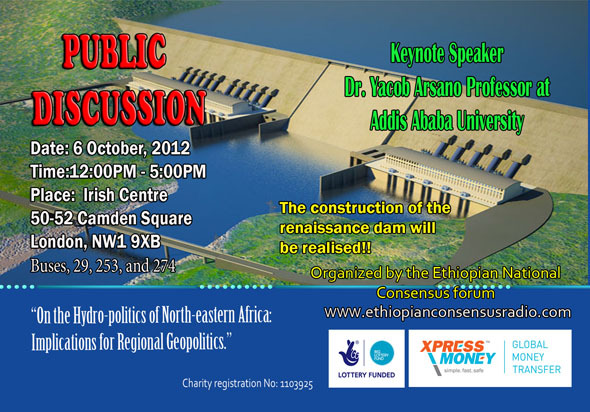 Towards Sustaining Optimistic Momentum in Ethiopia. The Dogs Shall Continue Barking, While The Camel Still Keeps on Walking: The Sorcery of Political Millenarianism.